It's summertime and everyone is looking for the perfect ocean scent to captivate them and bring them into the moment of this exhilarating season. Ocean fragrances can vary from salty, to beach grass to watery with so many blends in between. Starting with the most salty, Antousa Okeanos, for us, is the epitome of an ocean, summertime scent. It brings me to the sandy beaches of Cape Cod where the spray from the crashing surf fills the air. The air is thick and moist, blending the scent of sand and dune grass. The Anthousa Okeanos diffuser has an elegant summer look, with a speckled decanter and fragrance oil tinted soft blue. The Okeanos Candle is filled in a hand-blown tumbler that looks like sea glass. The Thymes Naia candle is a soft, elegant summer scent. It's more watery than salty with water lily, cyclamen, citrus notes and lychee. This is a delicate blend and a great hostess gift with is more general appeal. Naia is also available in a room spray and bath & body products. Seablue Sky is a new fragrance by Votivo. Unfortunately, we haven't had a chance to burn this candle yet. My hunch is that the true meaning of this scent comes alive when it's burning to distinguish it from the many other water-oriented scents by Votivo. Seablue Sky is a blend of fresh air, lavender and amber. 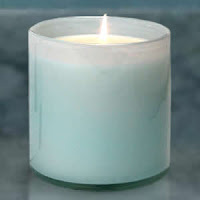 The cold throw for Votivo Seablue Sky definitely comes across as the most salty, ocean scented candle they offer. White Ocean Sands is a popular fragrance by Votivo. This scent was created to evoke the ambiance of a bonfire on the beach after a hot summer day. It is definitely more smokey and woodsy than Seablue Sky, but this is another one that we need to burn to get the true essence. Antica Farmacista Acqua is a watery fragrance, blending sweet musk and marine algae. It reminds us a lot of a linen scent or Washed Cotton by K. Hall. It's very fresh and clean, but not much like the ocean. Antica Farmacista Acqua is available in a demi and petite diffuser. Earlier this year K. Hall launched Shore-Line fragrance and it's an instant hit. Shore-Line has soothing watery, spa-like notes with a very clean and fresh finish. This water scent comes across more like cologne than ocean. K. Hall Shore-Line is available in a diffuser, diffuser refill and candle. We recently tried the Lafco Bathroom Marine candle and loved it. It is a delicate, summery scent and reminds us of the iced water with floating cucumber slices that you get at a spa. This cooling scent instantly soothes you on a hot, steamy day. The 4" x 4", hand-blown vase is stunning with the most gorgeous soft, blue hue that glows while the candle is burning. The Lafco Bathroom Marine candle mesmerizes you with it's beautiful look and delightful scent. The Trapp Ocean Marine candle has oceanic, aquatic notes with a hint of cassis. This I can't say this smells like the ocean, but it does smell a lot like water but with more character. The cassis gives it a bit of a kick with it's crisp note. For a flat, tap water like scent, try the Trapp Water candle. I need to try the Shelter Island (Ocean) candle by Jonathan Adler. It is a blend of fresh ocean notes, sea moss, sand grains, sage and fir balsam. It's cold throw is very oceany and salty and we can definitely pick up the grassy and sandy notes. I'm curious with how the sage and fir balsam interact with the summery notes while burning. Jonathan Adler candles tend to be highly fragrant. Aquiesse Shoreline is a newer candle for us and it's been a huge hit. It is a summery scent with a strong floral accord, not overly ocean. 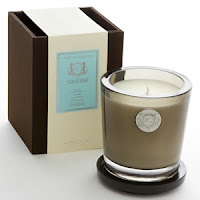 We love the way Aquiesse candles burn - very clean and even. This scent was very fragrant and lovely. The Pacifica candle by Archipelago Botanicals blends ylang-ylang, cedar and sea greens. It's a romantic summer scent - delicate and pure. It reminds me of when I was young, enjoying the beach a night when the heat of the sun is gone, the day relaxes, and the beach grass sways in the dunes while salty air swirls around me. Recently Voluspa launched their new Maison Blanc Collection which includes their Laguna fragrance. Voluspa Laguna has been an instant addiction for many. This summer scent has a strong floral accord. Freesia blends with warm air and sand to create a magical summer scent. Laguna is available in an adorable 2-wick tin, giant 12oz candlepot that last 100 hours, a ceramic candle that everyone has been raving about and a room & body spray. Voluspa candles burn cleanly and beautifully. This scent is very fragrant. The last three fragrances are candles that have ocean names or ocean descriptions but don't smell like the ocean at all. watery lily adds a nice water accord but freesia, pink rose and french verbena dominate this candle. The Ocean candle by Red Flower blends mangrove, bay lavender, beach morning glory and bay laurel leaf. For us, this scent comes across as eucalyptus. It reminds me of when I was a kid and would cover my face in Noxzema to take the sting out of a brutal sunburn. Red Flower Ocean has that same cooling, soothing effect, but doesn't smell at all like the ocean or water. Ocean burns beautifully as the colorful wax liquefies while burning and it is available in a 6oz and 1.5oz candle. The Le Cherche Midi 01 candle doesn't have an ocean name, but the description reads "It brings to life a tranquil ocean-side retreat where swaying beach grass, sun-dried driftwood, and summer herbs stir thoughts of sunset walks with family and friends." This candle blends lemon, bergamot, lavender and night blooming jasmine to create the most gorgeous cologne-like fragrance. Le Cherche Midi is an amazing and addicting scent that works well in any season, not just summer. Hope you find the perfect ocean scent for you to languish in during the hot, steamy days of summer.